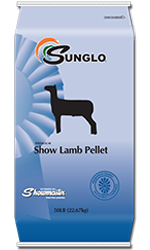 Formulated for lambs one week old through weaning as a creep feed and as the sole ration for lambs from weaning to 50-60 pounds of bodyweight. Ideal for show lambs, breeding ewes and bucks being fitted for sale. Also for newly purchased show lambs to help ease their transition and support continued growth and development.